Lockenhaus Burg is often called the last knight castle in Austria. It is an amazing and authentic medieval fortress, which now fascinates visitors with its original exterior, interior design, antique furniture, rich and beautiful interior decoration. Lockenhaus is best known for its excellently preserved Knight's Hall. Lockenhaus dominates with its vast shadow the small market town Lockenburg. It is located in the easternmost and least populated province of Burgenland Austria, near the border of Hungary. Burgenland is known as the solar land, and one of its bright rays is definitely medieval Lockenhaus. For the first time, historical texts mention of the fortress around 1200 when it was still named Leuca. Most likely, the castle was built in the early 13th century on a hill overlooking the valley. 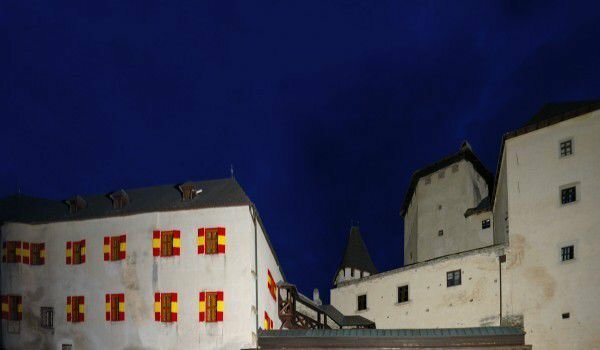 Today Lockenhaus is considered the last true knight's castle in Austria. Crypt in the castle and some other parts made in the 13 century are evidence of high skill and advanced sense of art. Since its construction in the coming centuries Lockenhaus was attractive to many artists, music, and today it is one of the favorite places for relaxation of businessmen and cultural figures. Everybody has the opportunity to stay in the fortress of the Knights and spend some unforgettable moments with beauty and charm of the local nature and history. Excellently preserved Knight Hall Lockenhaus is where visitors will feel the emanation of the overall atmosphere of the castle. The hall is huge and is decorated with beautiful frescoes on the walls. It is held every year called” Knight evenings”. Overall Lockenhaus was built in Romanesque style, but in later stages are added Gothic elements in architecture and interior decoration. In the festive hall of Lockenhaus regularly held are various festivals, such as that of chamber music in July. A separate room is available for anyone who wants to celebrate here their personal celebration - weddings, birthdays, etc. are often carried out in Lockenhaus . Among other attractive areas of the castle are the kitchen, Arsenal, Holy room, the Prince's chambers and chapels. Castle Lockenhaus has a hotel and a nice restaurant to it. In the Chapel of Lockenhaus we can see well-preserved frescoes from the time when the castle was built. Tours are conducted against an entrance fee of 5-7 euros per person, and for students it is twice cheaper. If you want to join the special knightly games, Lockenhaus need a reservation and a few euros. In Lockenhaus, a permanent exhibition of objects, uniforms, weapons and documents of Knights Templar is held, as well as visiting exhibitions.